ele me chamou atenção/me deu um toque: como dizer isso em Inglês? Chandler enters the room looking very excited about something. When his friends asks him what he's been up to, he mentions this woman he's been talking to through the internet. He says he understands he can be sometimes a little bit defensive and quipy, but she was the first one among the people he knows that had the courage to call him on it and say and he should cut it out and get real. But wait, do you know what to call someone on something means? When you call someone on something, you're calling their attention to something bad about them that they might ignore or choose to avoid. In the case of Chandler, as he said himself, he's always been someone very defensive and needed someone to tell him in a very straightforward way that he should change that. He was happy the his "virtual girlfriend" called him on that. Suppose you're someone very shy around girls and one day a close friend of yours calls you on it and says you should stop that, try to be cool and understand girls are not that scary. Your friend called you on your shyness, he called you on the fact you're just too shy and may be over thinking the way you behave around girls. He wants you to change for your own good. That's it for today guys. Take care! O que significa "make the rounds"? I was watching an interview the other day on Ellen DeGeneres show and I heard a very interesting expression: to make the rounds. Do you have an idea of what that means? Here's a little bit of insight on the interview when that expression came up: The president Obama had just been elected and a journalist from a magazine thought it would be appropriate to publish an article kind of calling him gay for simply supporting gay causes. The interviewee was asked what she thought about that, and she said it was pretty much junior high [meaning to be childish], and that rumors like take making the rounds in the United States are just embarrassing. When rumors make the round in some place, it means they're being passed from person to person. That's what was happening with the president when the interview was held. Many public people have to go through that kind of situation. Some random journalist thinks it's okay to spread rumors about someone in the media and everybody assumes it's true without questioning their sources. The same expression has a different meaning. For example, suppose you go to Europe and you make a point to visit as many museums as possible. When you come back to Brazil, everybody asks what places you've been to and you say you made the rounds of all the museums through the countries you visited. In that context, when you make the rounds in some place, it means you go from place to place. Pay attention to the prepositions in that expressions. You make the rounds OF a specific place IN a general place. For example, you make the rounds OF all the departments IN the company. Pretty easy huh? That's all for today. Talk to you next time! Mind your P's and Q's: o que isso significa? Suppose you're going to attend a job interview in a few days and now you're feeling very anxious and insecure about it. You've been unemployed for a while now and you really need that job, you can't mess up that opportunity this time. So you turn to a friend of yours for good advice on how to cause a good impression, answer the questions correctly and avoid making a fool of yourself. Among the many things she tells you, one of them calls your attention. She says: When you're being interviewed, try to mind your P's and Q's. Do you know what that means? Read on! When you mind your p's and q's, you behave properly, you make an effort to be polite and display good manners. There are certain theories on how that expression emerged, but the one that sounded more convincing to me comes from the advice that children are told while acquiring literacy. 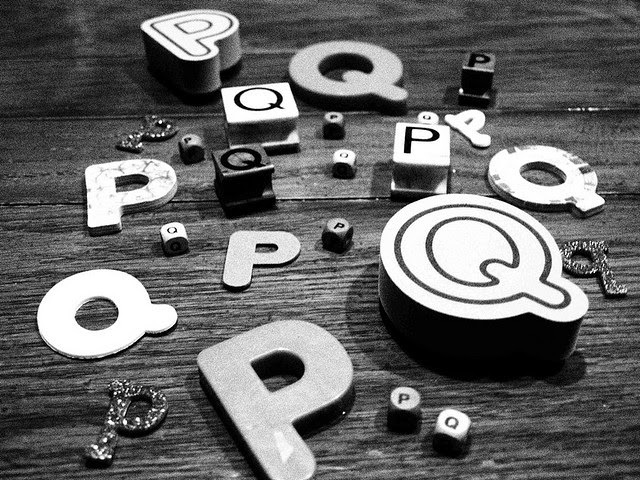 They're encouraged to mind the letters p and q for better reading skills. Speaking of children, it's very usual to see parents telling them to mind their p's and q's before leaving home. For example, you're taking your children to visit one of your friends but before you step outside you make them promise they'll mind their p's and q's. That means you want them to behave well and not embarrass you in front of others. That's it for today guys. Take care! O que significa "the proof of the pudding is in the eating"? In Brazil, we're at election time. We can already hear cars passing by with their powerful sound equipment advertising many kinds of candidates. During these times, candidates take their chance to bring attention to many kinds of problem in society and suggest a solution. That brings about a lot of hope to some people, but if you're like me, you may think many of them are just a bunch of liars that try to fool the population into voting for them so when they're finally elected they don't meet their promises. Suppose you're discussing politics with one of your friends and he's trying to make you believe so-and-so candidate is the best option for this election. Since you're always skeptical when it comes to politics you don't give it too much credit although that candidate's proposal looks promising. So you say: He seems a decent candidate and his proposal looks fine, but the proof of the pudding is in the eating. What does that mean? When you say that the proof of the pudding is in the eating, you mean that you can only judge something by its results, it means that you cannot judge the value of something until you have tried it. So in other words, what you said to your friend about that candidate was that you'll only be able to confirm that candidate's honesty when he's elected and doing the things he promised before. Just take the literal meaning of the expression. Just like you can only judge the taste of some food by eating it, you can only be sure a candidate's good after elections, when he's already working. That's it for today guys. Take care!